Today, I will show you a women’s backpack which has got not bad reviews. It’s women’s Isis Hydration Pack from Camelbak. And it is a women's specific minimalist pack that is great for staying safely hydrated when training for 2+ hours on the bike. 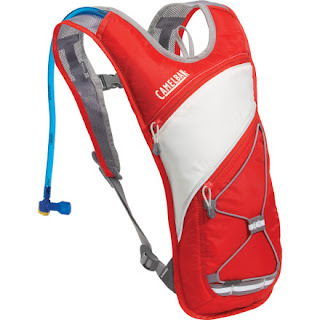 This CamelBak hydration pack is designed with a harness and profile that offer a more athletic fit for women. Harness: Women's fitlightweight mesh belt.Front and back reflectivity. Material: 210 D nylon, 70 D diamond Clarus nylon. Size: 14.75" x 8.5" x 3" Weight: No Reservoir39 lbs. Full reservoir 5.33 lbs. Hydration Capacity: 72 oz". And the users describe that this backpack actually offers a comfortable women's specific fit that is very comfortable on their hips and shoulders, is large enough to carry a full day's worth of gear (rain jacket, lunch, snacks, first aid kit, etc. ), has lots of pockets that make it very easy to find things, yet still has a low-profile design. It actually has all the features they were looking for plus extras. A great feature is that the hydration bladder is in a separate compartment so it doesn't affect the available space of the main compartment when the bladder is full. The side pockets are perfect for storing energy bars and other items they want within easy reach, the bungee carries their rain jacket, and the small front pocket is perfect for their first aid kit. The only feature the manufacturer shall add would be a small zip pocket on the hip belt to carry lip balm or keys. In a word, it is next to perfect.